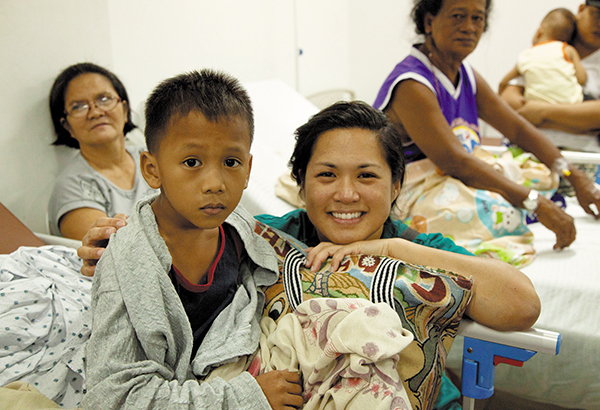 Dr. Nia Zalamea with patients and their family members during a medical mission in the Philippines. The Department of Surgery in the College of Medicine at the University of Tennessee Health Science Center has launched the UTHSC Global Surgery Institute to coordinate, support, and expand surgical mission work done around the world by faculty and students. Nia Zalamea, MD, an assistant professor of surgery, and Martin Fleming, MD, chief of surgical oncology and associate professor of surgery, are the organizers of the institute, which will anchor surgical mission work across the department, assist residents and students interested in mission work, and apply lessons learned around the globe to local delivery of clinical care. "It ties all of our separate projects into one home base," Dr. Zalamea said during the announcement late last month. Dr. Zalamea has done medical mission work annually in the Philippines since 1999 with her father, a nurse anesthetist, and mother, a nurse, both of whom were born in that country and came to Memphis in the 1970s. The family founded the Memphis Mission of Mercy, a 501 c (3) non-profit, and has made yearly missions to the Philippines since. Dr. Fleming has participated in medical missions to the Philippines with Dr. Zalamea's organization and to Tanzania to teach and perform clinical work. "Within the Department of Surgery, we've organized ourselves because there are all of these projects happening all over the world," Dr. Zalamea said. A survey done during the organizational phase showed approximately 20 surgical faculty members at UTHSC were providing 58 weeks of mission work each year around the globe on their own time. "That's breathtaking," Dr. Zalamea said. The physicians, many of whom, like Dr. Zalamea, are affiliated with Methodist Le Bonheur Health Care, donate their surgical skills to help people in China, Vietnam, Honduras, Nicaragua, India, and the Philippines, among many destinations. The survey also showed 60 percent of incoming residents were interested in doing international work as part of their training, and 65 to 70 percent of medical students had already been involved in international work prior to residency, she said. "That's a pretty moving statistic," she said. "Not only do they want it, but they've already engaged in it," Dr. Zalamea said. The UTHSC Global Surgery Institute is a partner of the American College of Surgeons, which links it with similar organizations nationally and globally and expands overseas opportunities and support. A Global Surgery Support Fund has been established through the UT Foundation to offer scholarships for travel expenses to medical students, surgery residents, and surgery fellows interested in doing mission work. To help fund the scholarships, the Global Surgery Institute is holding its first fundraiser May 11 from 6-10 p.m. at The Brass Door, 152 Madison Avenue, and the Madison Avenue Park across the street. Admission is $10, or $5 with a student ID, and includes refreshments and entertainment. Ethicon Endosurgery, a manufacturer of surgical devices, is helping sponsor the event. The UTHSC Global Surgery Institute includes an active student advisory and support group. One of those students, Janyn Quiz, 24, in her first year of medical school, grew up in the Philippines and moved to the United States two years ago with her family. "I'm really grateful for my country, and I want to give back to them as much as I can," she said.